Procrastination is when you find that you're doing everything but your work and making excuses not to do it. many indie-devs (me included) find ourselves starting projects and never finishing them. 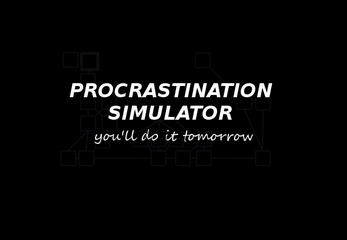 This game was inspired by this article on dealing with procrastination. if you have a feedback or found a typo welcome to this thread. if you have an idea to tell us on how to deal with procrastination This thread is for you. please enjoy this interactive fiction. I'm waiting for your comments & ratings.